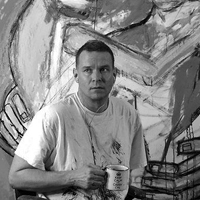 Without formal art education, Matt Sesow discovered painting as a hobby while working at IBM. In the evenings and on weekends he played with painting and began selling his work to Self-Taught and Outsider art collectors in 1995. Throughout the 1990’s he continued to paint and participate in art exhibitions while working full-time at variety of computer firms including AOL and Netscape. Returning from a stint with the Peace Corps (Solomon Islands) in 1999, Matt began to focus on his love of painting and developing a path to create art full-time. Painting is something I do everyday and it is what I intend to do for the rest of my life. Painting has healed me. I found painting at the age of 28 after moving to Washington, DC as a cure to the emotional pain I felt from losing my left hand as a child, after being hit by the propeller of a landing airplane in 1975. I am fortunate that people are willing to look at and buy my paintings. Because of that, painting is what I do now for my career. It is the sole source of my income. My paintings are the emotional response to a traumatic past, the road to healing, and the confidence of finding a new language to express feelings felt but never shared. While some people see my paintings as angry or aggressive, many of my collectors and fans (including myself), see my work as hopeful, joyous, and eager to take on the world! My sharp lines, bold colours, and a willingness to share hidden emotions through my art has gained me a huge following in the art world. My work started to sell in 1996 and since then I estimate that I have sold over 8,000 unique paintings to collectors around the world. Most of my paintings include the “icons” I’ve invented to help the viewer decipher the meaning of my work. Icons such as “trauma scars”, “trauma cups”, “bunnies”, “one-winged rising phoenixes”, and “guardian angels” are just a few of the clues or messages I use in each painting to help tell my story. My icons mark the time when the painting was created as well, they are an “emotional checkup” to myself, showing where I’m at, and when I look back at old paintings, where I’ve been. I’ve had 6 solo exhibitions in Europe and was the first American representative at the 42nd annual meeting of Naive Artists in Trebjne, Slovenia in 2009. For many of the people I met at the conference in Slovenia it was their first exposure to an American, let alone a Washington, DC artist ambassador. My third solo exhibition in Barcelona, Spain was in April of 2013. My future in the arts looks bright. With the soon to be internationally released stamps from the United Nations and my solo exhibition in France for 2014, the opportunity for me to connect with the world through my art will be unparalleled and unique. Bringing those experiences back to Washington, DC in order to share with other artists and interested residents is an exciting opportunity that I look forward to. 2013 Selected by the UN (United Nations) to be featured in their postal stamp program as a disabled artist. 2003 October: guest artist at Kentuck Festival (folk art festival in Tuscaloosa, AL). 2003 September: "Best artist" award at 25th annual Adams Morgan festival. 2003 August: Painted set for Hollywood play (f* Wasps); several large paintings used in the performance. 2003 July: conceived and began "31 days in July" project. 2003 June: selected by jury for first artist residency in Costa Rica; painted using oils and acrylics. 2002 February: lived for one month in Sofia, Bulgaria (“GEEKCORPS” volunteer); painted using acrylics. 2000 Moved into painting studio in DC. Began painting at feverish pace and working full-time as an artist. 1998 Travelled to the Solomon Islands as a Peace Corps volunteer; painted using acrylics and oils. 1996 First group exhibition at 'State of the Union' gallery in Washington, DC. 1994 Short films shown at WPA group exhibition and selected for DC Psychtronic Film Society exhibition. 1993 Began painting in oils; painting on weekends and evenings; works inspired by childhood trauma.